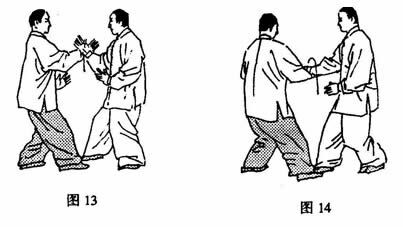 Ba Gua Rolling Hands Exercises (Rou Shou) are the Ba Gua Zhang equivalent of Tai Ji Quan’s Pushing Hands. The second of the Liang Style Ba Gua Eight Rolling Hands Exercises: Double Joining Palm. Excerpted from Compendium of Ba Gua Zhang Art by Guo Gu Min, Edited by Zang Xue Fan. Jilin Science and Technology Publishers. Main Points: Drop the shoulders, sink the elbows, relax the whole body and shift the weight on the posterior leg. 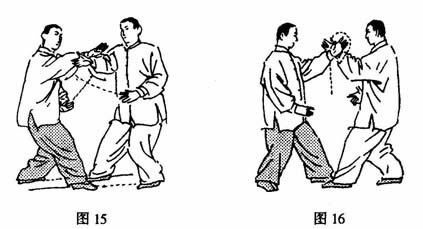 Main Points: The force in the wrists of both A and B should be identical during the practice. Main Points: As same as in Movement 2. Main Points: Drop the shoulder, sink the elbow and shift the weight on the posterior leg. Main Points: As same as Movement 2. Main Points: Drop the shoulder, sink the low back, relax the whole body and maintain a smooth respiration.